When my boyfriend and I moved into our new apartment we had a lot of white empty walls that we were looking to fill with unique artwork. We outgrew a lot of the previous pieces that were hanging up in our old apartment, or they no longer fit with the decor in our new place. We both have totally different styles; he’s into surrealism and I’m into trendy, street art, and pop art. However, there is once piece that we both equally agree on and thoroughly love which is our Star Map print by Modern Map Art. We collaborated with this digital design company that puts your favorite places onto gallery quality paper or canvas. These personalized, made-to-order prints are created in Los Angeles and use matte paper and Ultrachrome ink. They offer many different options; skyline art, typography prints, custom street maps and many more options to choose from. If you have something in mind they’ll work with you to create it. They also offer artwork on iPhone cases, pillows, and shirts. 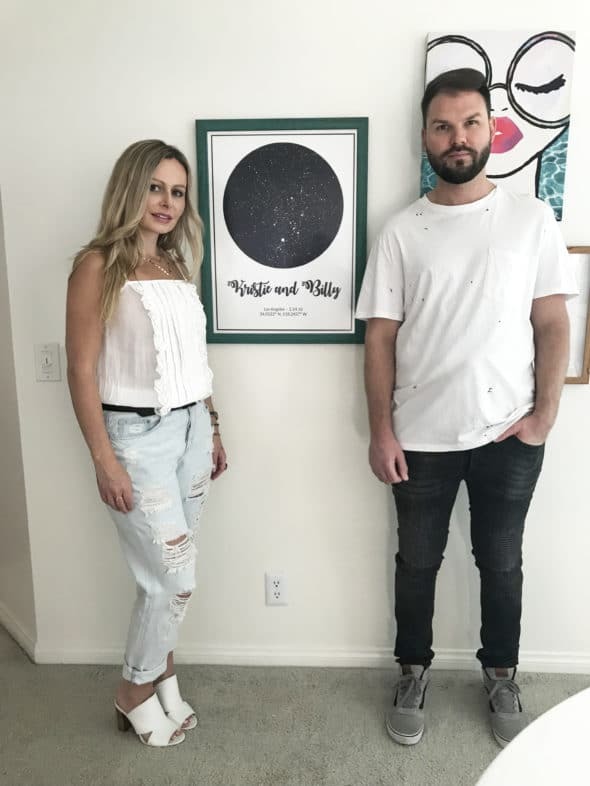 We decided on the Star Map because we wanted something that celebrated our life together, and that would look sleek in our home. It’s been hanging up in our apartment for about a week now and so far we’ve gotten so many compliments on it. Our friends ask us where we got it and tell us how original it is. The purpose of a Star Map is to commemorate a special event or time in your life. The process of having one made is super easy and affordable, and the maps are highly customizable. You go to their website, fill out a form and view the mockup of what you want before you place your order. 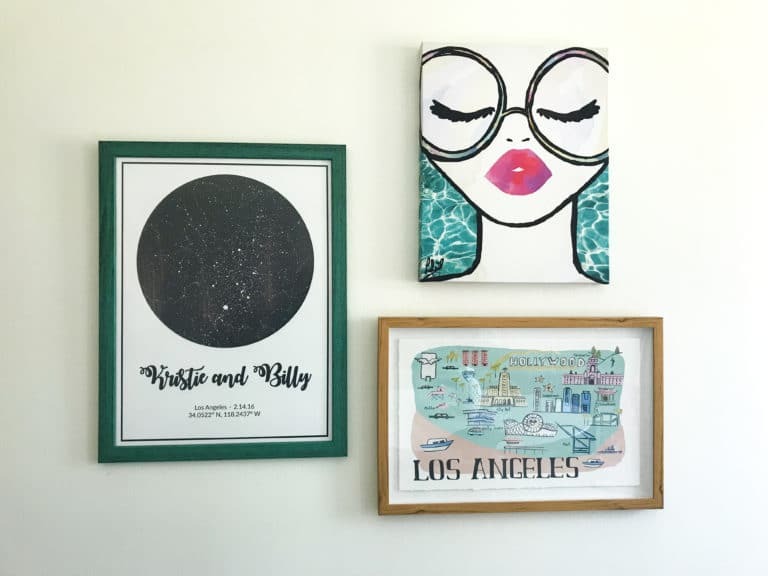 The first step is choosing between a framed poster, a canvas or a poster print. We chose to have a poster print made of the day we took our friendship to the next level. I had seen a teal frame on Amazon so I decided to purchase it for the print since it would add a nice pop of color to our white walls. The Star Maps are offered in five sizes starting with 8x10 and going as big as 24x36. We picked 18x24 because we were in need of larger size pieces. When it came to deciding on a color scheme there were six options to choose from. 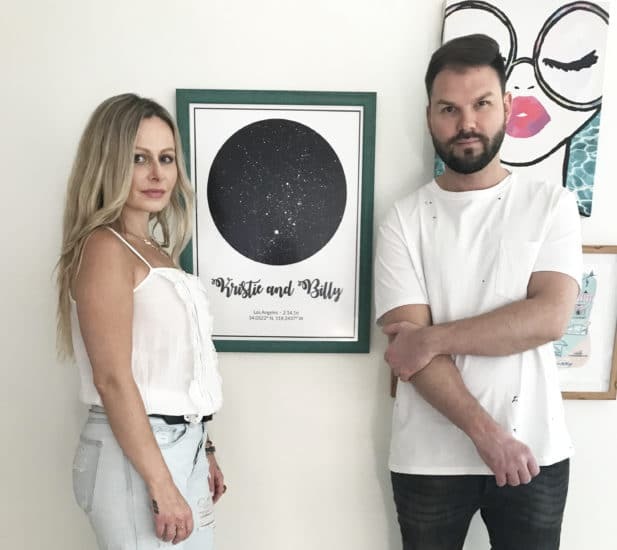 We chose the white poster/black sky, because it was visually stunning and would look gorgeous against a solid white wall. Now comes the really cool part. You enter the date and location of the memorable event you want framed and you will get the nighttime sky with the star alignment of that day, which makes it truly one-of-a-kind. Next comes choosing the text to personalize it. 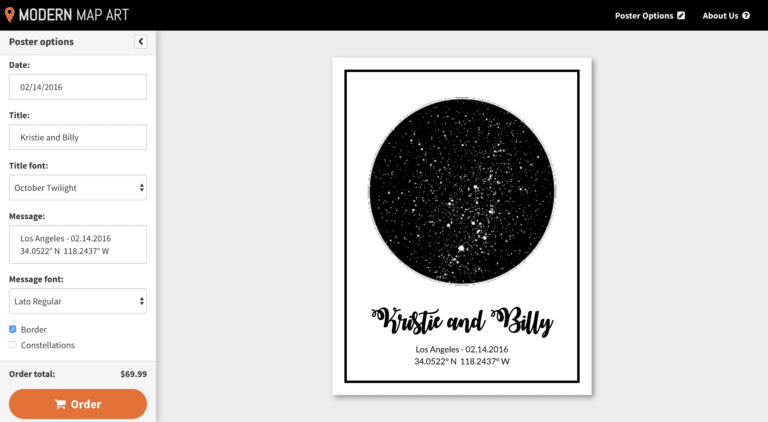 For our title we added “Kristie & Billy” and used the October Twilight font. In the message portion, we added “Los Angeles, 2.14.16” along with the coordinates and we chose Lato Regular font. There are six different fonts to pick from but we thought these two blended nicely together. The last part asked if we wanted a border and constellations. We checked yes for the border and no for the constellations. The prices start at $29.99 and go up from there depending on the size and what type of print you want. 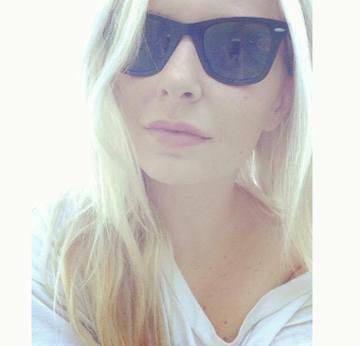 I’ve always loved giving personalized gifts because I think they have a lot more meaning. 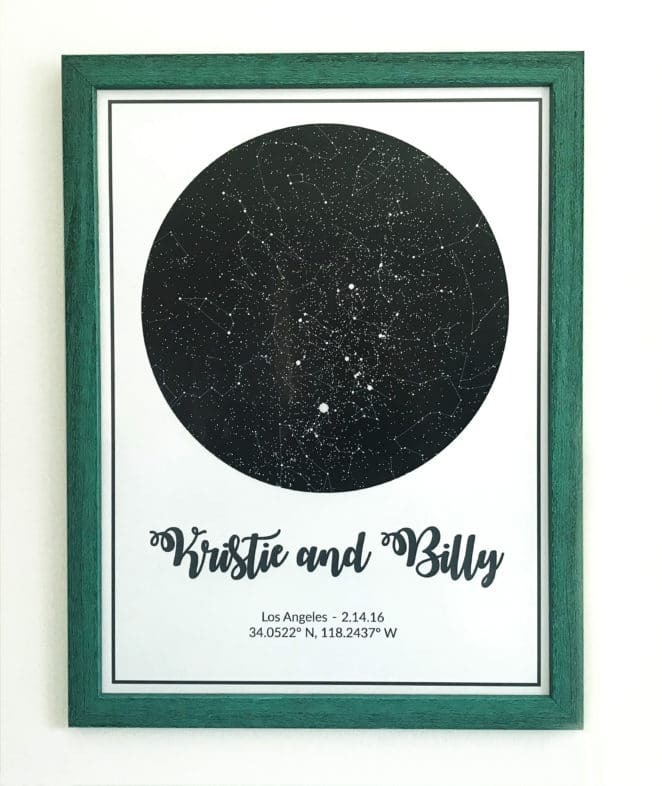 After seeing how easy it was to create our Star Map and how eye-catching it is as it hangs in our dining room, this will definitely be my go-to gift for engagements, graduations, birthdays, and weddings. What you'll need: a hammer, screwdriver, and tape measure, and then a level, stud finder, picture hanging kit, pencil, and the correct sized nails. Think about the location. You want your gallery to be seen and not hidden in a corner. Make sure there’s enough light whether natural or artificial. Make sure it is cohesive with the rest of your place. 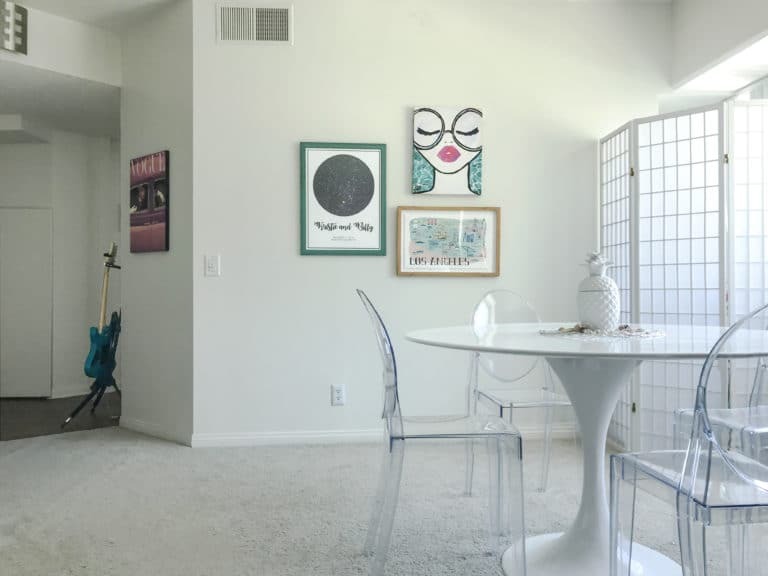 For example, our apartment is trendy and modern with white and teal being the main colors; therefore I wouldn’t hang antique wall art. Wall collage art: Group pictures by theme, color, or style. Make sure there’s some common element without being too matchy-matchy. Place photos up against the wall. Step back and take a lot. Do the pictures go together? Is the color scheme aesthetically pleasing? Use the gallery method to make sure your art is at the ideal height. With a pencil mark where the nail should go. Hammer into the stud. In my first apartment I tried to hang a ceramic antelope head. I picked a spot and started to hammer away. Little did I know I was hammering into drywall. When I went to hang up the antelope it fell to the ground, shattered and left a huge hole in my wall. This article contains some affiliate links and is sponsored by @ModernMapArt.